Jack W. Vaughn, age 97, of Caldwell, Ohio, died Wednesday, January 2, 2019, at The Lodge at New Dawn in Canton. He was born July 31, 1921, in Noble County, son of the late William A. and Edna Matheney Vaughn. He was a 1939 graduate of Dexter City High School, and he was a United States Army veteran, having served during World War II. Jack co-owned and operated Caldwell Auto Parts for many years, and prior to its founding, he was employed as a certified Chevrolet service technician for Barnhouse Chevrolet in Caldwell. He was a long time member of New Harmony Baptist Church, where he served as a song leader, Sunday School teacher, Sunday School superindendent, and deacon. In his spare time, he enjoyed working on his computer. Jack was a devoted Christian. 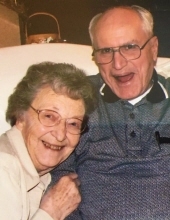 He was a loving husband, father, grandfather, and great-grandfather who was committed to his family. In addition to his parents, he is preceded in death by his wife, Mary Lillie Haines Vaughn, whom he married January 31, 1942, and who died November 25, 2017; three sisters, Melva Batten, Norma Reiter, and Mary Margaret Lowe; two brothers, James and George Vaughn; and a great-grandson, Nicholas Parcher. Surviving are his children, Terry M. (Paulette) Vaughn of Westlake and Joy C. (Duane) Jacobs of Canton; 6 grandchildren; and 11 great-grandchildren. Friends may call Friday, January 4, 2019, from 12PM-2PM at McVay-Perkins Funeral Home, 416 East Street, Caldwell, where the funeral service will follow visitation at 2PM with Pastor David Denny officiating. A veteran's graveside service will follow at South Olive Cemetery conducted by the Noble County Veteran Service Organizations. Memorial contributions may be made to the Cystic Fibrosis Foundation, Northern Ohio Chapter, 8001 Sweet Valley Drive, Suite 3, Valley View, Ohio, 44125. To plant a tree in memory of Jack W. Vaughn, please visit our Tribute Store. "Email Address" would like to share the life celebration of Jack W. Vaughn. Click on the "link" to go to share a favorite memory or leave a condolence message for the family.